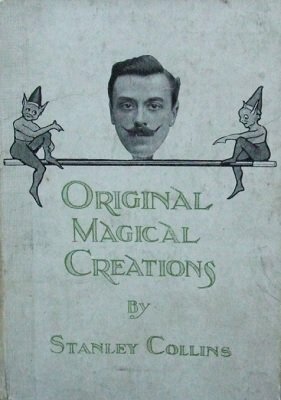 Magicians who are seeking that evanescent "something new" which, like the Family Ghost, is very often talked about but seldom seen, will, I venture to prophesy, find "something new" in Original Magical Creations. In penning this volume my aim has been twofold. In the first place, I have set out to describe in detail the methods by which certain experiments originated by myself are performed, and secondly my endeavour has been to teach how to perform them, which is a totally different proposition. To carry out this plan in its entirety, the inclusion of the covering patter becomes a sine qua non, and this feature of my book I am confident will be welcomed, as the patter in every case is arranged specially to serve the purpose all magical patter should serve, namely to cover up suspicious movements and to give specious reasons for doing things which would otherwise appear unnatural. In describing the various feats in connexion with Cards, I have presupposed the student to be acquainted with the familiar card sleights which are explained in numerous text books. Sleight-of-hand tricks pure and simple, however, have been omitted, as these I propose exhaustively dealing with in a section of another volume to be planned on lines identical with this.